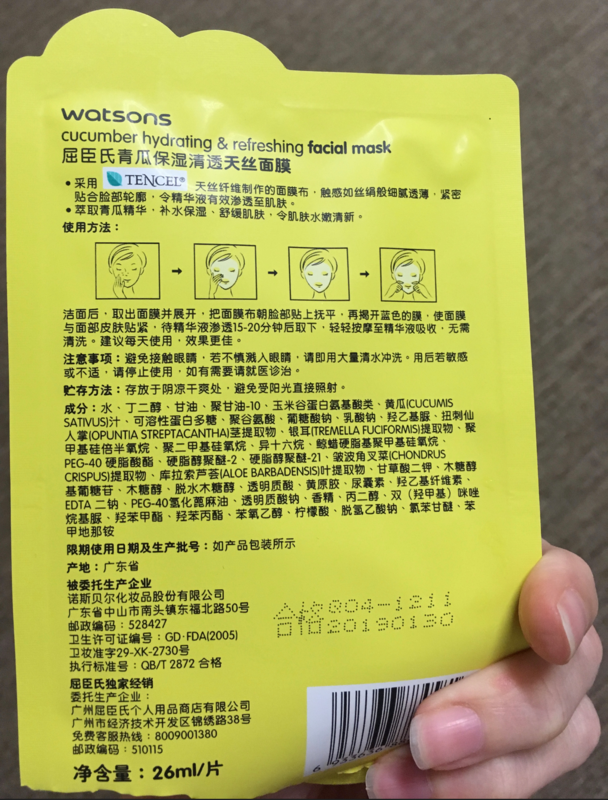 There’s a shop called Watson’s in China and Thailand that’s basically like the cosmetics part of CVS or Walgreen’s in the US. It has its own-brand of cheaper stuff, and I thought for about 80 cents, I’d try one of their cucumber face masks. 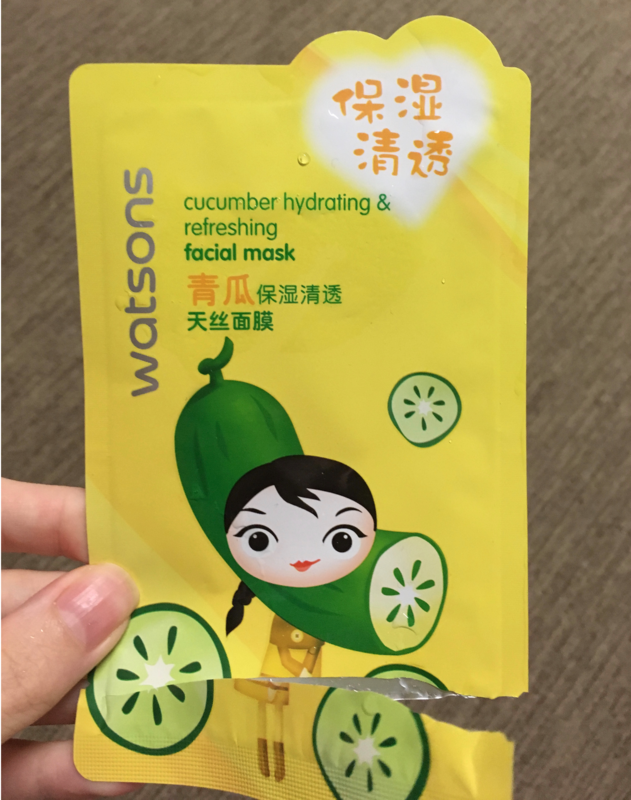 I’ve seen a few of the cheaper brands doing cucumber masks in China, and I thought I’d try one because they all claim to be hydrating. This was a sheet mask, which, like the other sheet masks I’ve reviewed in the past, is MUCH less messy than the gloopy non-sheet masks that you smear on your face. One of my favorite things about sheet masks is how great they are if you’re a busy woman, like most of us are these days. I mean, I really love some non-sheet masks, too, especially the Dermalogica vitamin mask, and one day soon I might even review it, lol, but seriously, the main reason I don’t use it more regularly is because I do not have the time to get messy. I put this one on my face for 15-20 minutes and when it came off, it took FOREVER to dry. I wasn’t in love with that. Nor was I in love with the fact that, after it did dry, my face felt sticky. I think the stuff this sheet mask was infused with was more of a gel than anything moisturising. I’m not sure if stuff like that works for anyone else, but I have normal skin that sometimes tends towards surface dryness, not a deep dry-skin issue, and I find things like gels and oil-laden creams don’t really help, and sometimes they even dry my skin worse or clog my pores. When I washed it off, my skin didn’t feel any more moisturized than before, but on the other hand, my pores weren’t clogged and I didn’t have a breakout, either, so I’m going to chalk it up as one for making you feel good, rather than one for getting actual results. I don’t think I’ll be buying it again, though, because I don’t usually have the time for face masks that don’t deliver great results. Oh, and one final thing. Last time I had a food-flavored face mask, Morgueticia challenged me to taste it, but I’d thrown it away and I never got another one exactly the same, so the world will never know if that one tasted of red wine or not. So, this time, I licked my finger VERY LIGHTLY after trying this one, then went and rinsed my mouth like a billion times because it just tasted like chemicals. I’m not completely sure this mask has ever seen a real cucumber. PS. This post is prescheduled, but only by a day or so. I didn’t get around to writing any more posts from the US or from Korea, but I’m taking today to get them done, even though that means trying to do them through the Great Firewall of China and the exceptionally crap internet at the place where I live.